Will New Pier 17 Venue Turn Residents into 'Unwilling Concertgoers'? Still image from a Howard Hughes Corp. promotional video shows the rebuilt Pier 17 mall as concert venue. A glowing rooftop packed and pulsing with thousands of concertgoers. Klieg lights beaming skyward above a neighborhood veiled in darkness. 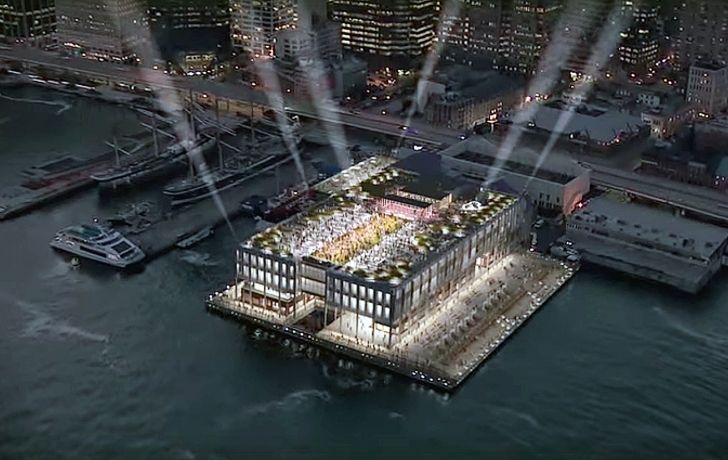 That vision of an entertainment venue on the rooftop of South Street Seaport’s Pier 17 mall appears only fleetingly in a promotional video for the Howard Hughes Corp.’s redevelopment plans for the Seaport. But it’s the perfect illustration of what local residents fear when the new mall is built: noisy events with 4,000-person-capacity crowds lasting well into the night. Concerns over disruptive events atop the building have publicly surfaced recently as the Hughes Corp. seeks permission from the Landmarks Preservation Commission to build a 30-foot-high canopy over the roof of the mall, located in the South Street Seaport Historic District. Sheltering the roof, opponents claim, would allow more events, bringing sleepless nights and raucous behavior to the neighborhood. “To have events with 4,000 guests on an open roof that can be used almost all the time will have a large impact,” said Roger Byrom, chair of Community Board 1’s Landmarks Committee, before the board voted last month to recommend disapproval of the canopy. Supporters for Hughes’s plans, which at the hearing mostly included business and labor groups, also maintained that the developer’s proposals were needed to help it provide, as Ann Kayman of the Manhattan Chamber of Commerce put it, “a much needed public amenity with a mix of uses” that is economically viable. “No one else is willing to contribute to accomplish this,” she said. Many who opposed the canopy, or “pergola” as it was called, said it would block views of the Brooklyn Bridge, a position that SHOP Architects’ Gregg Pasquarelli denied. “We cannot think of any place along the esplanade where the view of the bridge would be blocked,” he said. But the commission’s deputy counsel, John Weiss, stated that views of the bridge were not within the LPC’s purview. And the prospect of neighborhood disturbances was not up for discussion, either. Still, the size of the structure bothered several commissioners and they called on Hughes Corp. to return with additional renderings and, possibly, a scaled-down version of the structure.